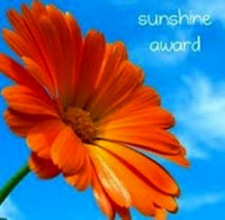 I smiled with joy when, upon opening a comment, I discovered that the writer had given me the Sunshine Blogger Award! What a treat and an honor. So thank you, Jay Morris, for honoring me so. I think my readers will also like your blog, which is The Wayward Journey (link will open in a new window). I must admit I’m embarrassed to be so late announcing this. Jay actually wrote to me at the beginning of January. However, it’s been a rough couple of months health-wise, so I am behind on many things! Now, I am feeling better, and the beautiful Gerbera daisy above heralds the beginning of spring. The requirements for accepting this award are that I tell you seven things about myself and that I nominate ten other bloggers for the award, not to mention letting Jay know how much I appreciate his award to me. Let’s start with the seven things about me that you may not know. 1. I’m a cat person. I like dogs and had them while I was growing up, but I adore cats. I love their independent spirits, their ability to take care of themselves when I leave for a few days, and the way they curl up in balls when they sit in my lap. 2. I’ve traveled to South Korea, Japan, Mexico, the U.S. Virgin Islands, Costa Rica and Puerto Rico. I lived in Korea for nearly two years and loved that wonderful country and its friendly, loving people who always had a smile for this expat. I took an eco-hike on St. Croix and learned many things about herbal medicines from the naturalist who led the hike. 3. I’ve been in every state in the Union except for Maine, Massachusetts and Alaska. I would love to visit Alaska one day. It’s been a dream for many years. 4. I have one daughter, who is 39. She is a woman of many talents. I adore her and her son, who is the light of my life. When he moved back to be with his dad during his teenage years, I missed him so much I could hardly stand it. But I am so grateful for the spending most of the first ten years of his life near him in person. We had wonderful times and still do have beautiful, warm talks and hugs when I see him! 5. My favorite color is yellow. My sofa is yellow, and the chair that goes with it has lots of yellow too. Yellow is such a sunshine color and always makes me feel great, whether it’s in my own living room or at the store buying flowers. I hope my daisies will come back this year. 6. I love gardening and I have had several wonderful combination veggie/flower gardens. Unfortunately, because of my health now, I can’t garden like I used to. However, I can do container gardening. In 2012 I had way too many containers with plants and flowers and veggies! It took me 1/2 hour to 45 minutes to water them each day. But they were beautiful. 7. It is still my dream to travel more. I would like to go to the holy healing places of Medjugore and Lourdes. Maybe God will send me a miracle healing if I go there. Of course, maybe He’ll send one even if I don’t! Next, I’d like to go to Israel. It doesn’t seem like a very safe place right now. I always pray for peace in that region. Finally, I’d like to go to Eastern Europe and see the Czech Republic and some other places. I hope one day I can achieve this dream. But if I don’t, I feel blessed and grateful for the traveling I’ve already done in my life. Many folks haven’t even been out of their home city or state. Okay, now for the nominations. 1. Monce Abraham is a writer who lives in India. His blog posts will really make you think. They’re not fluff at all! 2. Lead, Learn and Live is David Kanigan’s inspirational blog. 3. Piya Singh is an Indian Artist, currently living and working in Germany. I think you’ll like her creativity. 4. Charlie and Tom are photographers whose work is lovely. Their blog is PhotoBotos. 5. Shannon Elizabeth Moreno writes about her strong faith in Revelations in Writing. 6. Marney McNall scribes her volunteer experiences in The Volunteer Fringe. 8. Loolie and Poolie have a fun blog about their vacations: The Adventures of Loolie and Poolie. 9. Dianne Gray is an award-winning Australian author. Her blog is Writing and Loving Life. 10.Speaking from the Heart is an out-of-the-box blog by a woman who is a holistic health practitioner.